It is possible to introduce anchor forces and surcharges of rock blocks. 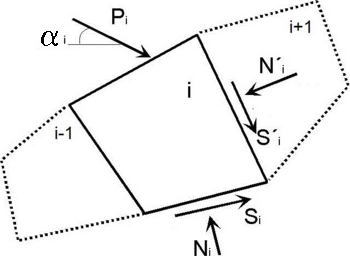 The resultant of forces Pi [kN/m] acting on the ith block is then determined. All forces acting on the block including the water pressure on the slip surface and the block separating joints are taken into account. It is possible to input surface, strip and trapezoidal surcharge of terrain. The program then determines their effect on individual rock blocks. The applied anchor force is adjusted per 1 m run based on the specified horizontal spacing of anchors.